Electronic Arts CEO John Riccitiello seems to be having a little fun with Bobby Kotick's reaction to Battlefield 3, saying the game's performance at E3 obviously "got his goat." Activision CEO Bobby Kotick tried to squeeze in a little undermining at E3 last week, saying that he couldn't comment on how the game might compete with his Call of Duty franchise because he'd only seen it running on PC and "if it's just a PC title, as it looks like today, that's just a small audience to participate." Of course, Kotick knows full well that Battlefield 3 is coming to the Xbox 360 and PlayStation 3 as well as the PC and everybody knows he knows, which is probably why Riccitiello appears to be having a little fun with the situation. 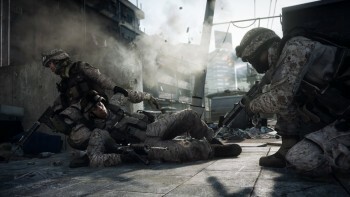 "It's the beginning of the war [between Battlefield 3 and Modern Warfare 3] and [Kotick] recognizes they're going to be threatened. We're going to have a clash of the titans this fall," he told Reuters. "The very fact that he's trying to cast doubt on our game is a perfect example of how we got his goat." "In terms of where this goes, we think our PS3 game is better than their Xbox game and our PC game is better than their PC game," he continued. "If that's all he's got to say, it's obviously going to evaporate as we launch all three. If you went to our press conference, you saw the PS3 footage and the Xbox footage. If Bobby thinks that is PC footage, he's in real trouble." It goes without saying that, just as Kotick is obligated to get a little zingy with the upstart competition, Riccitiello has to maintain a certain level of bravado as he gets his fighter ready for the ring. Not that it's entirely without basis; the Call of Duty franchise is a monster but the pre-release coverage of BF3 has so far been very positive. Maybe Bobby really does have something to worry about this time around.